Choose how you want to experience Dailynews. Get 50% off for one year. Cancel Anytime. 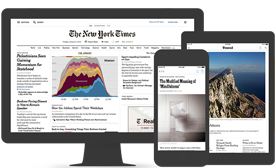 Explore complete digital replicas of every issue of The Times published from 1851 to 1980 with TimesMachine. Access to the entire NYT Cooking recipe archive. Learn with our how-to cooking guides, and build and organize your personal Recipe Box. 1 complimentary All Access subscription (now including Crossword and Cooking) to give to anyone you'd like (a $25/month value). Engage directly through subscriber-only calls, chats and live streams with journalists and newsmakers, and enjoy special discounts and behind-the-scenes access. 2 complimentary All Access Plus subscriptions (now including Crossword and Cooking) to give to anyone you'd like (a $70/month value). 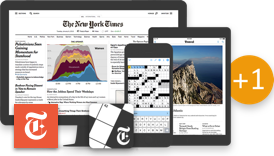 Get unlimited NYTimes.com access for organizations, at special group rates. Mobile apps are not supported on all devices. Does not include e-reader editions. Offer not available for current subscribers. All subscriptions will automatically renew and your credit card or PayPal account will be charged in advance of each four-week billing period unless canceled. Other restrictions and taxes may apply. No. 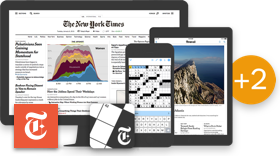 A digital subscription package gives you ongoing access to NYTimes.com on any computer or device, plus NYTimes apps for your smartphone and/or tablet, depending on the option you choose.